Fluidity of movement can be a beautiful thing. When so many games best moments are described as “epic set-pieces”, few can really hold up their controls as their defining feature. Chasing Aurora is one of those games. You control a bird, flapping its wings with the A button while learning to tap rhythmically to maintain a good speed. Steering is done using the analogue stick while the right triggers will cause your buzzard to nosedive at breakneck speed. There’s a NiGHTS into Dreams-esqe distinction of flight that’s just as dreamy and, in the absence of a fully-fledged single-player offering, Chasing Aurora asks you to master it. Alone, you’ll run rings around 20 art-deco triangular designs trying to keep within the lines to keep the timer from running out. Other courses will throw rockslides to duck and weave through; gusts of wind to accelerate up, and water you’ll learn to turn into a springboard. 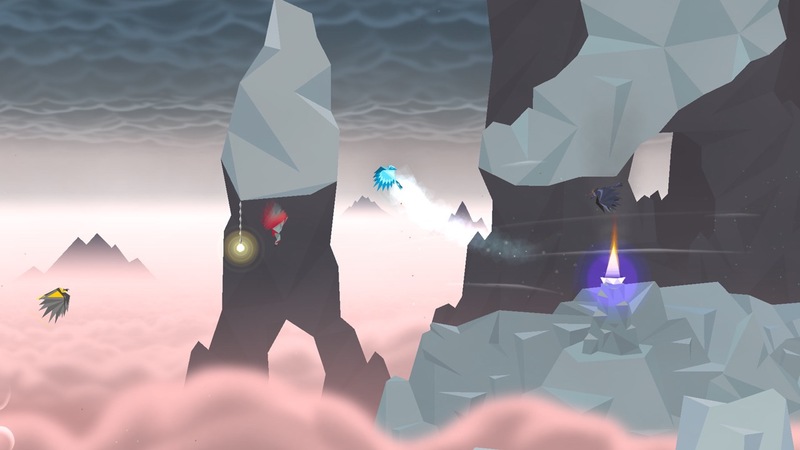 In multiplayer, Chasing Aurora takes cues from Nintendo Land with a round-robin of chase modes. Hide & Seek tasks up to four players to hunt down the player using the GamePad whereas Ice Tag works in reverse giving the GamePad player the ability to freeze others. Chase is a far more interesting set-up. Players frantically flock to pick up a gem whose heft will slow the carrying player down considerable. Whoever is holding the gem will be in control of the screen and will score points if they’re able to lure the other players off-screen. There’s plenty of neat ideas in Chasing Aurora but not enough to satisfy that £10 price tag. Anyone considering downloading this to play alone will feel cheated while party seekers should come prepared with Wii Remotes. A game with all the extras but lacking a solid campaign, Chasing Aurora alludes to a bigger, much grander experience somewhere on the horizon.